Vultures. Cartoon characters in parched deserts often wish them to disappear, since circling vultures are a stereotypical harbinger of death. In reality, vultures in some parts of the world are in danger of disappearing. And according to recent research, such a loss would have serious consequences for ecosystems and human populations alike. The primary threat to vultures is the presence of toxins in the carrion they consume. On many continents, vultures are the unfortunate victims of poisoned carcasses — especially impactful because dozens — or even hundreds — of vultures can feast on a single carcass. Populations of most vulture species around the world are now either declining or on the brink of extinction. Losses of vultures can allow other scavengers to flourish. Proliferation of such scavengers could bring bacteria and viruses from carcasses into human cities. In 2004, Çağan Şekercioğlu from the University of Utah, published a study examining the respective extinction risks of all bird species throughout the world. He noted then that vultures represented the single most threatened group of birds. More than a decade later, Şekercioğlu and Evan Buechley examined factors affecting the extinction risk of more than 100 bird species, including 22 species of vultures, which eat carrion exclusively, and other scavenging birds that have broader diets. Their results suggest several inherent ecological traits that likely contribute to vultures’ extinction risk, including their large body masses, slow reproductive rates and highly specialized diets. The greatest external threat to vultures, however, is poisoning. Poisoning is the greatest extinction risk facing vultures, and impacts 88 percent of threatened vulture species. The poisons come in many forms. In North America, the California condor, a vulture, experienced sharp declines until only 22 individuals remained by 1982. The leading cause of decline? Toxic lead bullet fragments in the gut piles left behind by hunters after animals had been field-dressed. Intensive conservation efforts helped the species to rebound. The condors now number well over 400, and range over large areas of California, Arizona, Utah and Baja California, Mexico. In the mid-1990s India experienced a precipitous vulture decline, with more than 95 percent of vultures disappearing by the early 2000s. The cause was eventually traced to diclofenac, a veterinary anti-inflammatory drug that relieved pain in cattle, but proved highly toxic to vultures. Hundreds of vultures would flock to each cattle carcass. And if the cow had recently been treated with diclofenac, hundreds of vultures would die. Because of this highly gregarious feeding behavior, less than one percent of cattle carcasses contaminated with diclofenac could account for the steep vulture decline. Fortunately, international cooperation led to a total ban on veterinary diclofenac use. Buechley says the numbers of vultures have stabilized, and are now showing signs of slowly increasing. 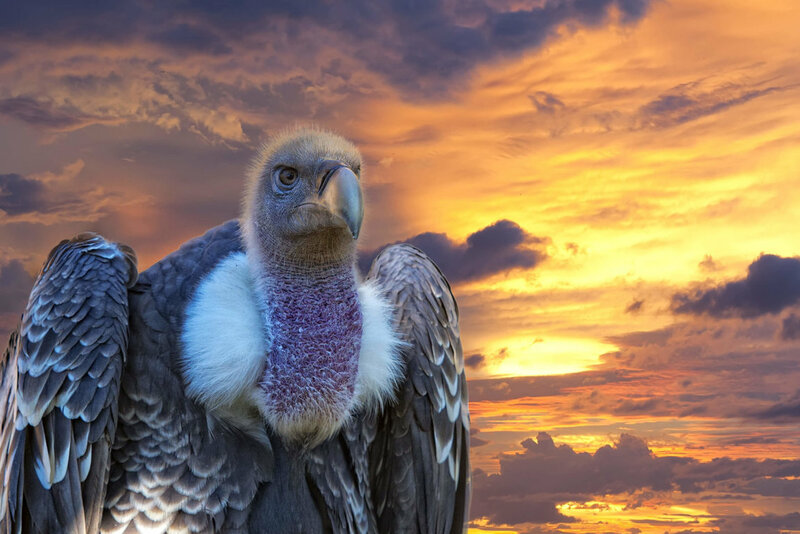 Now, the center of the vulture crisis is in sub-Saharan Africa. Potent newly affordable poisons are used to control predatory pests, such as lions or jackals. The poisons are so toxic that they can cascade through ecosystems: birds, mammals and insects are often found littering the area around these poisoned carcasses. But, as the predominant scavenger, vultures take the brunt of the poisoning and face the largest number of casualties. For example, an elephant carcass poisoned in Namibia killed as many as 600 vultures. In other cases, vultures are the victims of poachers who poison carcasses so that vultures do not give away the location of illegally taken animals. In vultures’ absence, other scavenger populations increase to take advantage of all of the uneaten carrion. By some estimates, in Central America, South America and Africa, vultures eat more meat than all predators combined. Without vultures, animals that eat carrion as a part of their diet (called facultative scavengers, as opposed to vultures, which eat only carrion) proliferate to take advantage of the available nutrients in a dead carcass. Crows, rats, dogs — any of these species can suddenly become abundant and dominant, to the point of crowding out the remaining vultures. Hundreds of vultures on a carcass can easily frighten away packs of dogs. But when only a few vultures are left, the dogs can rule. Such changes in populations of certain animal groups can upset the balance of food webs. All these facultative scavengers are also predators, and so they also go out and eat other organisms, causing a cascading effect. The impact of vultures’ declines are not limited to the realm of ecology, however. Vultures are highly efficient consumers of carrion, sometimes locating and consuming carcasses within an hour, before other forms of decay can set in. And vultures’ stomachs are highly acidic, killing nearly all bacteria or viruses that may be present in carrion. Combined with the fact that vultures rarely come in contact with humans, vultures serve as a barrier to prevent diseases from proliferating in dead animals and spreading to humans. Other facultative scavengers are not so adapted, and could pass along those diseases into human populations, as many are already fixtures in cities. For example, following the decline of vultures, India experienced a strong uptick in feral dogs — by an estimated seven million. The increase in dogs, potentially feeding on disease-ridden carcasses, is thought to have at least partially caused the rabies outbreak that was estimated to have killed 48,000 people from 1992-2006 in India — deaths that may have been avoided if not for the disappearance of vultures. Members of the Parsi sect of Zoroastrianism experienced a different impact. For thousands of years, the Parsi people have placed their dead on exposed mountaintops or tall towers for vultures to consume. The practice is called “sky burial.” But with few vultures and unable to properly handle their dead, the Parsis experienced a crisis within the faith. Some constructed captive vulture aviaries. Others talked about desiccating bodies using focused solar mirrors. The Parsis’ plight exemplifies the vultures’ role in south Asian society — and the various impacts if the vultures aren’t there. Although the vulture crisis in Africa is ongoing, scientists can predict what the outcome will be, based on previous experiences in India. Crows, gulls, rats and dogs will boom. And the rabies outbreak in India may just be a prologue, because several sub-Saharan Africa countries already have the highest per-capita rabies infection rates in the world. Rabies is only one of the many potential diseases that vultures had helped regulate. The poisoning that is killing vultures is also affecting many other organisms throughout ecosystems. But vultures are the most sensitive canaries in ecological coal mines. The story of the California condor shows that recovery is possible, but at a high cost that countries in the developing world may not be able to pay.